Is there a "flip book" app for android? A:In the iTunes app store, there are a few apps/games where you can make a flip book by drawing slides and putting them together. Is there anything like that in the android market? 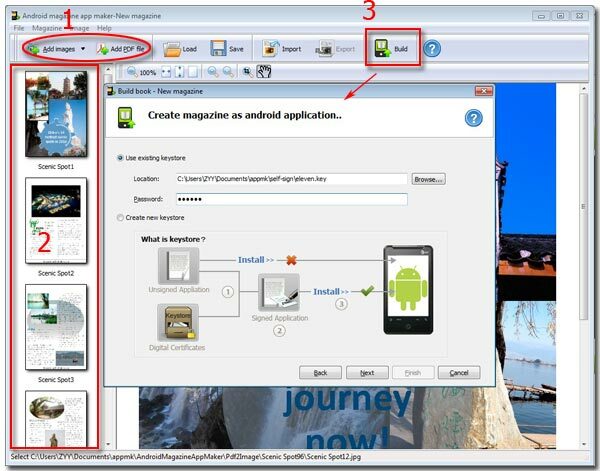 Android book app maker and Android magazine app maker can produce book, magazine and comic, etc flipping effect apps. You can directly make your text, PDF or image files into page-turn books for Android Market. Even you can embed Admob ads in content to earn commission fee. You can encrypt content, custom book basic information, choose RTL (Right to Left) or LTR (Left to Right). The output book app allows readers to custom font size, color, even can change the background color to eye health. The output magazine, comic is clear and easy to view, flipping effect is vivid. Easy-to-use and visual interface guid you with easy steps for convert content to Android apps.